The Centurion adjusted his armor, but his shoulder still ached. His uniform seemed top-heavy with passing years. He puffed his chest a bit and paraded past the sentinels keeping watch from the tower of Antonia Fortress. He took his favorite spot in the corner with a commanding view of the Jewish temple. Rebellious fanatics. And today even bloodier. They called it the Passover, something about freedom from slavery in Egypt. How could they remember something that supposedly happened before the founding of Rome? Freedom? He shook his head, knowing the Jews would always be ruled by the Romans. The courtyard was already jammed with worshipers with their goats and lambs ready for sacrifice. Long lines of priests readied with knives and blood cups. He had heard that up to a quarter-million animals were slaughtered and then roasted. More than a million extra worshipers from the countryside and beyond crowded Jerusalem for the feast. Damned locals then burned up the leftovers, and he never got a bite. And what a mess of blood, guts, and dung to bring more flies. He turned to his left and scanned east across the Kidron Valley to the Garden of Gethsemane and the graves blanketing the Mount of Olives. The waste from his fortress and much of Jerusalem was dumped further down the slopes into that valley. The breeze from the sea blew across Jerusalem and kept the stench of trash and dead bodies away from the city. At least the Jews did something right. The Centurion stared at Gethsemane. Last night got him thinking about his soul. Would he cross the Styx to the Fields of Elysium? Or was there more? He had been warned about trouble from the man they called Jesus, and then he saw him in action. His soldiers grumbled at being called to duty in the evening when their eyes drooped from wine, but the tower sentinels had spotted trouble. They carried torches to quickly make their way to the garden and a crowd with swords and clubs. He recognized some of the chief priests and several from the Sanhedrin. One man called another, “Rabbi,” and kissed him. We were told he had identified Jesus. Another man beside Jesus pulled his sword and swung, cutting off the ear of a servant. The Centurion drew his sword, ready to take charge, when this Jesus spoke calming words and touched the servant’s ear. Jesus’ touch healed the man. Healed! He then remembered the story of his fellow officer in Capernaum whose servant Jesus had healed. Why did the Jews hate this miracle man? To stop further trouble the Centurion agreed to arrest Jesus and have him bound. This appeared to be a religious matter and not criminal, so Jesus was led to the house of Annas, some relation of the High Priest, and left there. He was glad it was over and went back to the fortress to share a bit of wine. But the healing last night tickled his wonder. “Stop!” he yelled at the man leaving the city gate below. It was one of the three he would crucify that day, the robber Barabbas. The thief had escaped. The Centurion turned and told the sentry to watch where Barabbas went. He descended and ran to assemble his cohorts for pursuit. He found his men making sport of three prisoners, beating, mocking, and spitting on them. One in a scarlet robe with his head bleeding from a braided crown of thorns looked like Jesus. What? Governor Pilate had allowed a rabble crowd to free Barabbas and crucify Jesus instead? What stupidity. The Centurion put on his helmet and shook his head, the red plumes grabbing his men’s attention. The prisoners were commanded to pick up their crosses and get moving. The crucifixion party left the nearest gate for a place the locals called Golgotha, or the Cranium, an apt name for the skull-shaped hill on the edge of the garden. A large crowd followed. As they came out the gate, Jesus faltered, weakened from the extra beating. The Centurion stepped in front of a burly man coming in from the country for the Passover celebration. He slapped his medals with authority and instructed the man to pick up Jesus’ cross and carry it to Golgotha. The Centurion had his men offer Jesus a painkiller, wine mingled with myrrh. Jesus tasted it and refused. Nails pounded, and gritting teeth stifled cries of pain. The bleating and gurgle of lambs and goats drifted from the temple. The Centurion glanced in that direction and could see many staring at the three bodies hanging on the crosses. A striking reminder of challenging Roman authority. For his soldiers it was just another crucifixion, and they sat down and cast lots for Jesus’ seamless tunic. Watching in front of the garden party were Pilate along with some chief priests and a local politician he knew. Pilate wrote a sign in Hebrew, Greek, and Latin that proclaimed, “King of the Jews.” The priests objected but Pilate ignored them and had it posted over Jesus. Some of the passers-by heading for the festival paused long enough to mock this King. Something about him destroying the temple and rebuilding it in three days. They joined the priests with a challenge to Jesus to save himself and come down off the cross. That would be a problem for his soldiers. The two thieves on each side of Jesus also taunted him for a while. Then one acknowledged that they deserved crucifixion, but Jesus had done nothing wrong. He asked Jesus to remember him when he came into his kingdom. Jesus promised the thief he would be with him in Paradise. Was it that simple? Someone pointed out Jesus’ mother in the watching crowd. A man he had seen at Gethsemane the night before stood beside her. Jesus spoke from the cross to his mother, indicating the man beside her was now her son, and to the disciple that she was now his mother. They nodded. Three hours had passed, and the mood quieted with a background of pain and sorrow. Or wonder? His soldiers looked bored. Then his view almost disappeared as the blackest clouds he had ever seen blotted out the sun. Someone screamed the hosts of heaven had spread their wings. Pilgrims stumbled past leading their lambs and goats to sacrifice. At the temple there was a commotion and lamps were lit. Most of the crowd sat in low conversation or silence for the next three hours. Then Jesus spoke from his cross. Some said that he asked for someone called Elijah and that he was thirsty. He was given a sponge of sour wine. Did Jesus smile? Then he wailed a loud cry and slumped. He looked like he had died. The Centurion turned toward screams from the temple, hard to see in the darkness. A chief priest standing by him said they were saying the veil of the temple was torn in two from top to bottom. Then he mumbled something about it being in one piece for five-hundred years. Immediately the ground shook hard enough for rock to split and tombs on nearby Mount of Olives to open. Bodies could be seen rising from their tombs and moving, alive. He dropped to the ground and wrapped his arms around his legs, rocking slightly. His soldiers came over and huddled next to him as if for protection. Many in the crowd left beating their breasts. But he was a Centurion. He stood to attention and adjusted his helmet. Let’s get this finished. He had agreed with the priests that everyone be dead and in the ground before sunset. He ordered the legs broken of those on the crosses that they might die quickly of suffocation. A soldier with a club broke the legs of one thief. His scream brought everyone back to the horror of Golgotha. When he started to hit Jesus, another guard stopped him and jabbed his spear into Jesus’ ribs. When he didn’t flinch, the soldier shrugged and moved on. He swung again, the snap of bones drowned out by the other thief’s last howl. The man he recognized from the city council called Joseph came forward and asked Pilate for the body of Jesus. He said he had his new tomb nearby at the edge of the garden. Pilate agreed and appeared pleased. Jesus’ mother didn’t claim her son, probably because she didn’t have time to find a tomb. The chief priests had arranged for a quick burial for the two thieves down the valley in the Potter’s Field. The Centurion and his soldiers were left to later track down Barabbas to rot with his comrades. Joseph and his friends appeared to have been prepared for this moment, already having with them burial spices and a clean linen cloth to wrap Jesus’ body. They carried him to the nearby tomb, followed by many of Jesus’ supporters. The Centurion and several of his soldiers followed further back to ensure safe delivery of Jesus to his final resting place. The tombstone thumped as it hit the wall to close the tomb before sunset. The crowd stared silent for a few moments and then began to drift away. 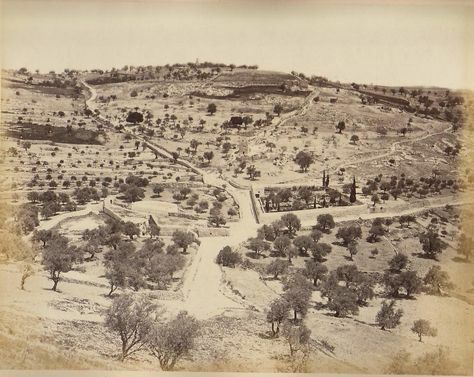 The Centurion surveyed the location, a garden at the base of the Mount of Olives. He had watched this area from the tower at Antonia Fortress with its famous tombs. It was the premier burial spot in Jerusalem. Joseph must be rich. He and his soldiers hurried back to the fortress in the failing light. The dark clouds had blown past to reveal a full moon rising. The conversation turned to what they might have for dinner, hoping it was roast lamb. And a little extra wine. The next morning the Centurion surveyed from the fortress tower. The holiday was quiet with a local ban on travel and work. He never got a day off. Only a small number of priests appeared around the temple. All was quiet toward the Mount of Olives. Then a silent group of men came out of the gate below him, led by priests who witnessed Jesus die the day before. They were followed by uniformed temple guards and servants. They stopped in front of Jesus’ tomb and spoke in low voices he could not hear. One servant poured a jar of wax between the stone and the wall, and a priest impressed a seal into it. The party left, leaving behind two guards. Why? No one would break into a tomb with nothing but a dead body in plain linen and no possessions. Curious. There must be more to know about this Jesus. *** Josephus – As recounted by the first-century historian Josephus, the Centurion’s perspective matches. For example, the comment about a quarter-million animals being slaughtered is confirmed in Wars 6:9:3. *** Roman crucifixion - The Romans crucified in public places for all to see and remember. Many were left hanging days after death. These areas would have been where they could easily monitor and stop possible attempts to remove the crucified before death, suggesting likely disregard for local customs or religions objections. *** Golgotha – The Centurion's point of view is adjusted to events toward Gethsemane. For Golgotha, the Gospels use the Greek Κρανίου which better translates "cranium" in Latin or English. A small hill shaped like the top of a skull lies outside the city gate from the Roman fort. "Cranium" is likely the site of Calvary. *** Tomb – There are a number of first-century tombs at the north end of the Kidron Valley and Garden of Gethsemane, notably the traditional Tomb of the Virgin Mary. Was Mary buried in the tomb of her son, Jesus? *** Tomb Seal – Joseph of Arimathea rolled a large stone against the entrance of the tomb. (Matthew 27:60, Mark 15:46) When the women arrived Sunday morning, they were concerned about who would roll away the extremely large stone. (Mark 16:3-4) This is typically understood to have been a large disc-shaped stone rolled from the side. However, of 900 tombs surveyed in the Jerusalem area from the Temple II period only four were found to have used a large disc, one in the upper Kidron Valley. The usual seal was a squarish plug, which could have been rolled into position and then slid into the opening. *** Elijah – Just before Jesus died, He spoke the words of Psalm 22, “My God, my God, why have you forsaken me?” Some watching understood the tradition of the Psalm (with Malachi 3:1, 4:5) that this was a call for Elijah to announce the Messiah. Others in the crowd mocked them to see if Elijah would come and save Jesus. The “cup of Elijah” is included in the Passover Seder as a symbol that he would be the messenger for the Messiah. John the Baptist denied being Elijah. (John 1:21) Jesus said if one was willing to accept it, John was Elijah. (Matthew 11:14) You decide if he was Elijah after John denied it and was beheaded. 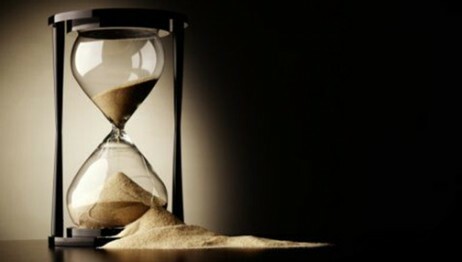 Those witnessing Jesus’ death were still waiting for Elijah. After Jesus’ death the Centurion cried, “Truly this man was the Son of God!” (Matthew 27:54, Mark 15:39) Jesus’ supporters and detractors all heard the clearest declaration that Jesus was the Messiah from the pagan who had directed his execution. Did the Centurion speak with the spirit of Elijah? *** Veil of Temple - Immediately after Jesus breathed His last, the veil of the Temple was torn in two from top to bottom (Matthew 27:52, Mark 15:38, Luke 23:46). This veil separated the Holy of Holies from the rest of the Temple and world where sinful man dwelt. Once a year the high priest entered into God's presence to make atonement for all the sins of Israel. With Jesus' death and the separation of the veil, God extended his forgiveness to all mankind. John, the only disciple reported at the site of the Crucifixion, did not report the veil torn. The Centurion reacted primarily to the earthquake and bodies rising (Matthew 27:54). There is no indication the torn veil was visible from where Jesus died. This would require an exact view in line with the Temple at a time of darkness when the veil was primarily lit by the golden menorah. The cries of anguish from priests at the temple would have echoed across to the Mount of Olives. *** Traditional Sites – Queen Helena, mother of Emperor Constantine, visited Jerusalem in the early 4th century. She was shown many holy sites where memorial churches were built. The Church of the Holy Sepulcher sits west of the old city wall, the traditional location of Calvary and the tomb of Jesus. Tests of cement from the tomb confirm it is 4th century construction. Was this a garden location? The only garden identified in the Gospels is Gethsemane, the other mentions in parables. The Romans would have had more difficulty monitoring many crucifixions across Jerusalem in that upwind, western location. The Garden Tomb is near the Church of the Holy Sepulcher at Skull Hill. It is a now a lovely place to visit, but the tomb has been dated to the 7th century BC. 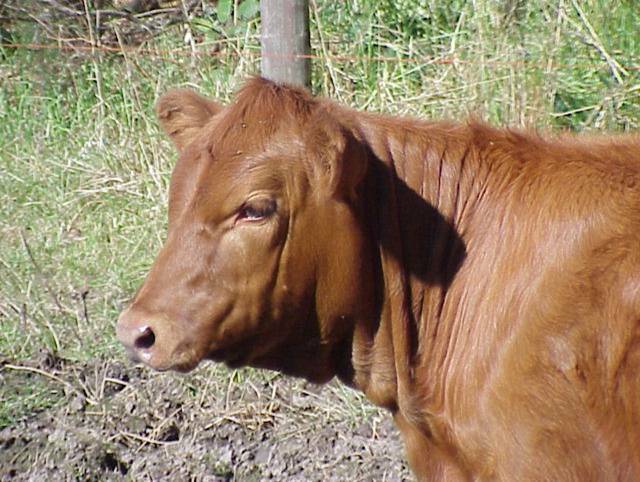 The Epistle of Barnabas 8 equates Jesus with the red heifer, and the place of his Crucifixion has recently been equated with the location of the burning of the cow. This was done "outside the camp" (Numbers 19:3) on the Mount of Olives, across a bridge opposite the Temple. Several possible locations for the burning of the 10th Red Heifer and Crucifixion have been suggested. With Hebrews 13:11-14, after Jesus "suffered outside the city gate," it follows, "Therefore let us go to Him outside the camp, bearing the disgrace He bore." We go spiritually "outside the camp," as the passage concludes, "For here we do not have a permanent city, but we are looking for the city that is to come." The Crucifixion was likely outside the city gate, illustrated below to the right before the towers of Antonia Fortress. The Red Heifer site for the Crucifixion also requires two assumptions. 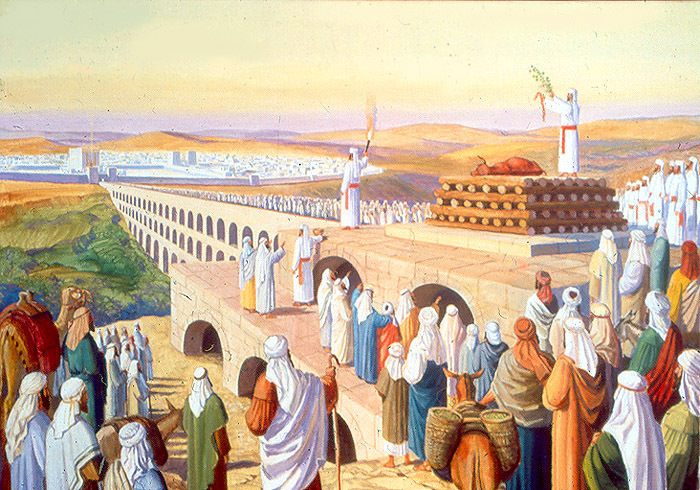 First, that the the Romans would have performed crucifixions to satisfy the Jews, here in a specific location, across the bridge where a red cow was burned. Wouldn't the priest have objected to crucifixions contaminating this holy site? And, second, that the tearing of the veil before the Holy of Holies was visible from the site of the Crucifixion. A sharp-eyed disciple John did not report it. It would have quickly been a news alert to those witnessing the Crucifixion from the Temple Mount. This would have been a double problem for a Crucifixion near the Church of the Holy Sepulcher. 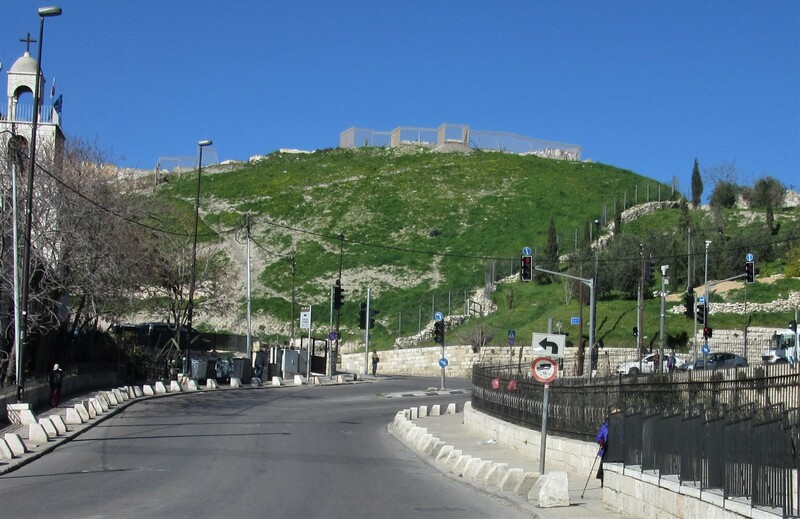 *** Mount of Olives – Jesus crucified, and there entombed, resurrected, ascended, and will return (Zechariah 14:4). Welcome back! *** The Day and the Hour – Jesus died on the cross on Nisan 14 at 3:00 in the afternoon. That day fell on Friday, April 7, 30 AD. See HERE.